The Segerstrom Center for the Arts announced three new initiatives poised to transform cultural life in Orange County: two programs—the Center for a Dance and Innovation and the Center Without Boundaries—and a new plaza designed by Michael Maltzan Architecture (MMA). 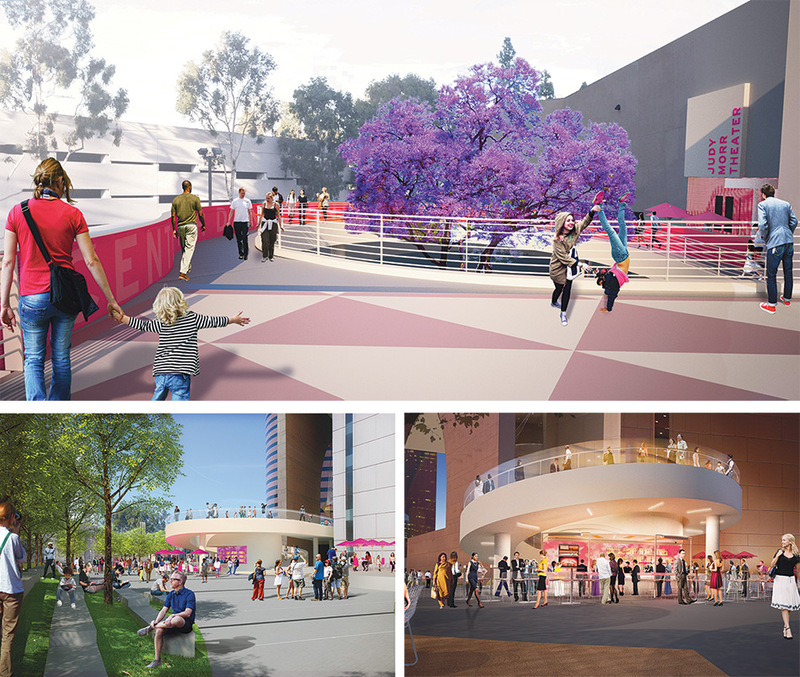 While the two centers plan to focus on creativity through movement and civic engagement, MMA’s design for the Julianne and George Argyros Plaza sets the stage for these activities by reinventing the existing Arts Plaza as a public gathering place with a public stage ready to host free events for up to 2,000 people. 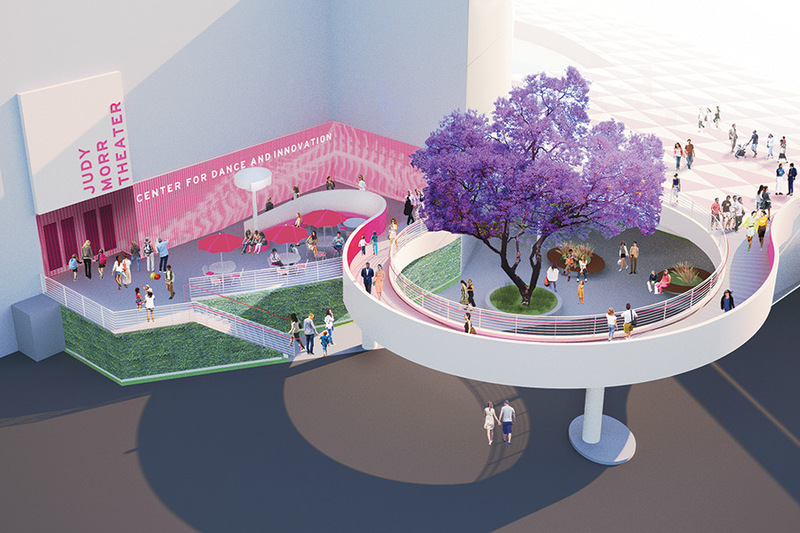 More ambitious than a simple plaza, as the initiative’s title may suggest, MMA’s scheme is a comprehensive reworking of the outdoor spaces around Segerstrom Hall. The campus was originally master planned by Pelli Clarke Pelli Architects, who also designed the adjacent Renée and Henry Segerstrom Concert Hall, with landscape by Peter Walker’s PWP Landscape Architecture. A street once passed through the campus, and while it has long been closed, it left behind a public space out of scale with the surrounding buildings. According to Maltzan, the design responds to the need for outdoor areas at a number of scales and includes intimate seating, as well as a large public space and multi-purpose community stage. 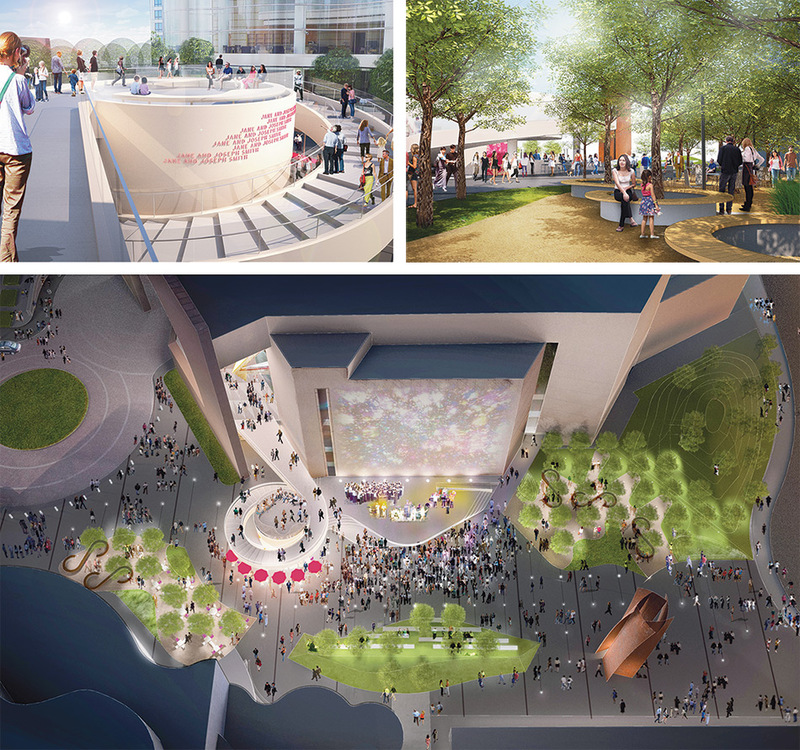 Renderings of three shaded green spaces—the Plaza Entry Grove, the Amphitheater Grove, the Community Picnic Grove—show casual public seating areas and pedestrian paths tucked under the tree canopy. 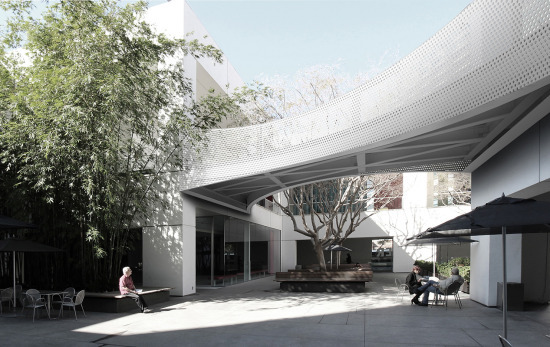 The main architectural component of the scheme is a circulation sequence that connects the main parking lot (via a sweeping ramp) to a walkway that passes through Segerstrom Hall and connects patrons via a grand staircase to the plaza. These circular set pieces are signature Maltzan—a combination of gestural form and circulation seen in microprojects like the John V. Tunney Bridge at the Hammer Museum or at the infrastructural scale, like the Sixth Street Bridge. Programs such as an outdoor cafe and an observation deck are also integrated into the stair form to compliment the strong geometries of the existing building. 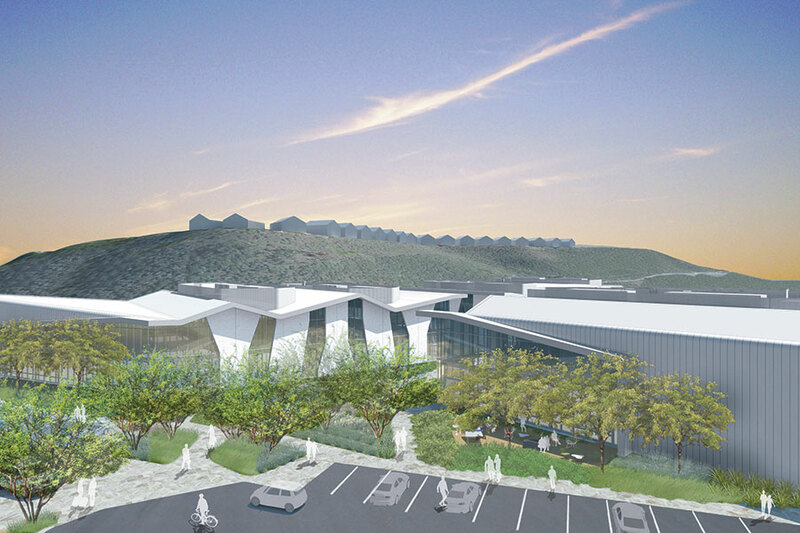 This is not the first time a top firm has been asked to enhance the arts campus. It’s a tough suburban setting to perk up: the site is indecorously located across the street from South Coast Plaza in Costa Mesa. In 2008, Morphosis was selected to design the new Orange County Museum of Art to be located on a parcel across from the concert hall. That plan for a 72,000-square-foot building stalled out due to the economic downturn, but there are still hopes it will move forward. Support for plaza project and programming comes from The Segerstrom Center for the Arts’ $68 million Next Act Campaign. This fundraising includes a $13.5 million gift from Julianne and George Argyros. Construction starts on the plaza early 2016, with completion slated for fall 2016. 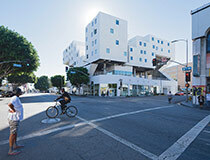 Leong Leong was selected to design the master plan and new buildings for the Los Angeles LGBT Center in Hollywood. The pair's resume includes fashion house Philip Lim as well as the design of the United States Pavilion of the 2014 Venice Architecture Biennale. The firm is known for using common materials in uncommon ways, with results that belie humble beginnings: a sleek facade composed of mirrored louver blinds, sound insulation foam transforms into a chic wallcovering. The new project is their biggest commission to date and includes a 183,700-square-foot facility and a campus plan that, with the existing building, covers more than a city block and includes 140 units of affordable housing for seniors and young adults, 100 beds for homeless youth, a new senior center, retail space, a center for homeless youth, and an administrative headquarters. The scheme will be centered on a series of courtyard spaces and plazas. 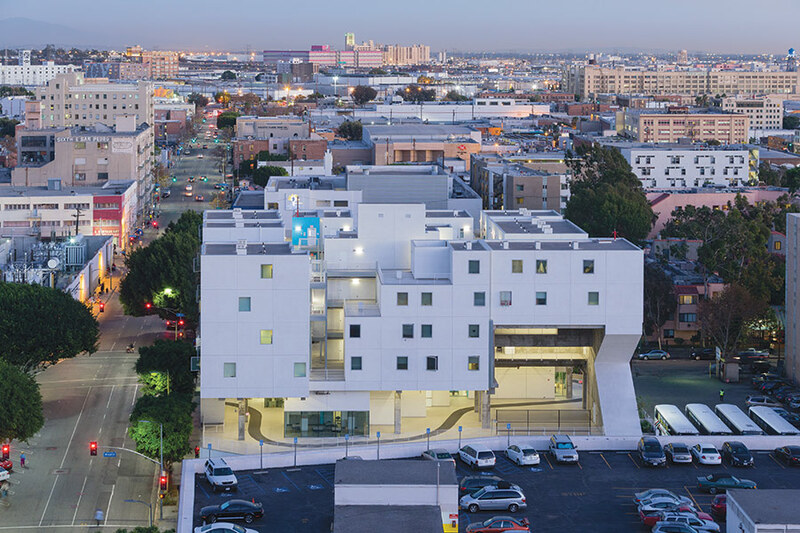 The Los Angeles LGBT Center and housing developer Thomas Safran & Associates chose Leong Leong from a shortlist of five firms, which included Michael Maltzan, Frederick Fisher, Predock Frane, and MAD. The commission is a collaboration between the firm, executive architect Killefer Flammang Architects and landscape architect Pamela Burton. 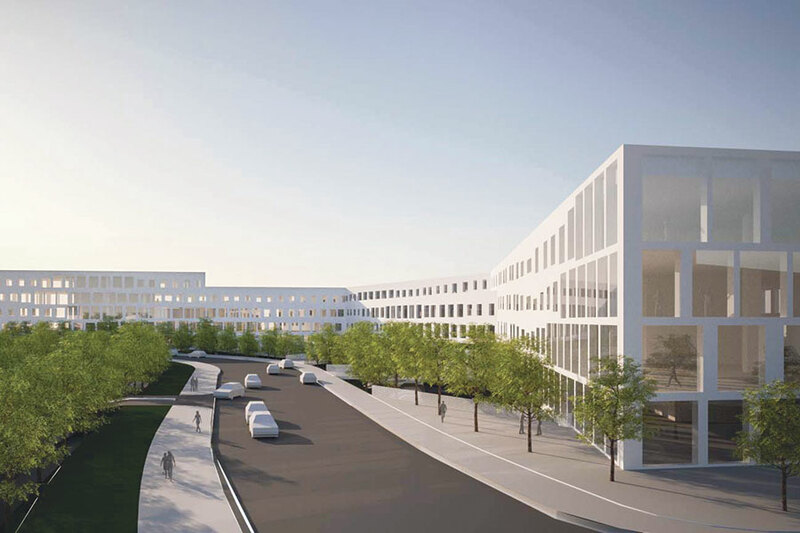 “The design concept is to create a mosaic of unique spaces and programs that—together with The Village at Ed Gould Plaza—will form a cohesive campus along McCadden Place. 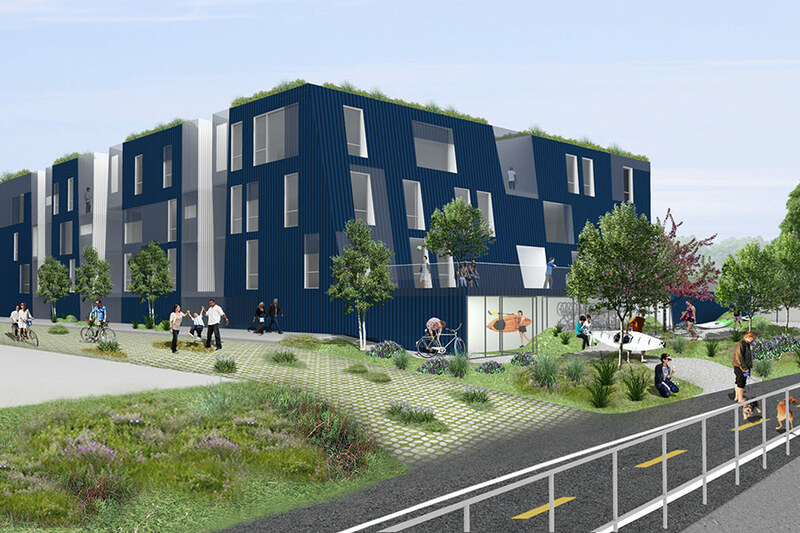 We hope the project will become an urban catalyst for the neighborhood, connecting residents, clients, staff, and neighbors alike,” says Chris Leong. 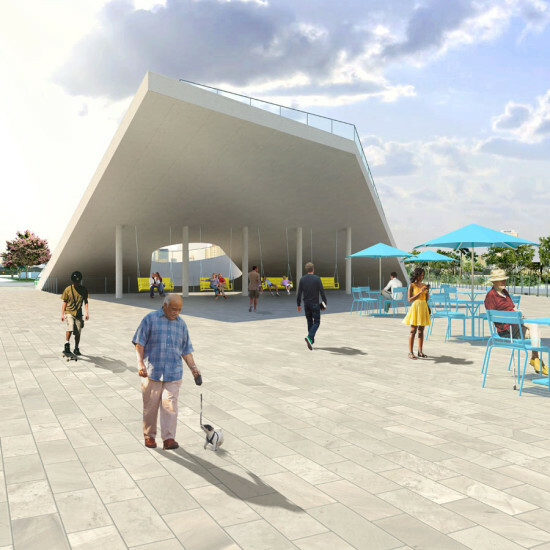 The redevelopment of St. Petersburg, Florida's iconic pier, with its very 1970s-esque inverted pyramid, is finally ready to move forward. The local city council has approved $5.2 million for the the structure's replacement which was designed by ASD, Rogers Partners, and Ken Smith. The money will go toward finalized designs, demolition of the existing pier, and initial contract services. This has been a long time coming. In 2011, the city hosted a competition to redesign the pier which resulted in fantastical renderings from the likes of Michael Maltzan Architecture, the Bjarke Ingels Group, and West 8. Michael Maltzan took the gold, but the plan stalled when voters rejected footing a $50 million bill. Fast-forward to December of last year when eight more proposals for the site were released as part of a second pier redevelopment competition. This time, teams had to work within a $33 million construction budget. (A St. Petersburg city official told AN around that time that the funding for the project had already been allocated.) Now jump to this spring, when it was announced that the team of ASD, Rogers Partners, and Ken Smith had won the competition with its proposal for Pier Park—a new public destination with a grove, sloped lawn, public seating, boardwalks, and areas for fishing and kayaking. As part of the scheme, the existing inverted pyramid isreplaced with a geometric pavilion that houses classrooms, a bar and grills, and restrooms. After all of this, the redevelopment is now ready to get underway. "The schematic design phase is scheduled to take five months and will include feedback from residents," said the council in a statement. "Following the design refinement, the community will be engaged to learn about the concept as the city moves forward on the final design, permitting and ultimately, construction." Eavesdrop> Hollywood Hits the Beach: Who will live in Michael Maltzan’s new triangular house? Malibu’s coastline is defined by an unbroken band of residences; their repetition and consistency of scale reduces the individual house to a stripe in this striated border separating the Pacific Coast Highway from the expanse of the ocean... The form of the Broad Beach Residence arises from the confluence of these circumstances. The house consists of a single bar punctured by a tapered form that expands towards the ocean. As visitors pass through the threshold of the bar, the building’s form maximizes framed views to the western horizon by extending the visual limits of the house to embrace the ocean beyond. The residence’s formal inflection scales the domestic in counterpoint to the horizon. Simultaneously, the form creates a more consensual relationship between the residence and the beach, between public space and private space, and between the perception of scale and its physical form. This spatial infiltration is mirrored in the sectional overlap of the public beach and private space of the home. Sand slips like a carpet under the floating mass of the house, a thin stair slumps from the structure to the beach floor, and a heavy mass rises out of the sand to support the main volume above. As the angular form faces towards the water, it carves out twin courtyards that flank the interior spaces and restore a middle-scale to the composition at the edge of the land. LOHA's Blake 1901, a multifamily residence proposed in Elysian Valley, next to the Los Angeles River. If there’s a better city for residential design than Los Angeles, the world’s architects have not found it. From the historical pastiches of the early 20th century, to the modernist movement, to the pioneering designs of some of the world’s most famous contemporary architects, LA’s varied terrain, blank geographic slate, and utter unfamiliarity with tradition has resulted in some of the most notable single-family homes in the world. What the city now needs, though, is much more than sublime boxes and clever uses of industrial materials. LA is built-out and a housing crisis is raging. Rents have crept up for years, due in part to chronic under-production of housing. Last summer, a UCLA report confirmed that LA is the least affordable city in the country, as a function of average salaries and average rents. In April, LA Mayor Eric Garcetti addressed the housing crunch by presenting a wide-ranging agenda for economic and ecological sustainability called pLAn. One part calls for the creation of 100,000 units of housing by 2021. At least 17,000 of those units are to be located within 1,500 feet of a public transit stop. The city currently has 3.8 million residents and 1.4 million units. pLAn seeks action through a variety of policies, collaborations, and funding sources; some of them already underway. Through the re:code LA effort to revamp the city’s zoning code, Garcetti has called for the completion of the city’s long-delayed community plans, updating land use to match current residential priorities. He has also pledged to streamline permitting for transit-oriented developments and secure funds to preserve and subsidize below market-rate housing. Los Angeles’ community of architects, developers, and planners have long been united in asking the city for more opportunities to build (often over the objections of homeowners groups and others who favor slow growth). Within this alliance, it is largely up to architects to figure out what the new, larger Los Angeles will look like and how it can grow. The most straightforward approach—which the city has endorsed in places—is to erect large residential towers, presumably on high-capacity transportation corridors. That’s happening in downtown, Mid-Wilshire, and elsewhere. But many of the city’s architects favor more subtle approaches that acknowledge the city’s diversity. Attractive small apartment buildings not only offer more opportunities for creative design, but they also have a better chance of gaining neighborhood acceptance with a scale that is more in line with the character of LA. Kevin Daly, principal at Kevin Daly Architects, cited the city’s history of courtyard housing and small modernist buildings that can fit relatively seamlessly into existing neighborhoods. “The more tailored the housing is to the unique conditions of that project, the greater chance you have of real success of building community and connecting to the larger context,” said Michael Maltzan, principal at Michael Maltzan Architecture. Some architects advocate an even smaller approach—one that might be invisible to homeowners, who are often on the front lines in the fight against density, traffic, and aesthetic offenses. For every single-family home in Los Angeles, there’s typically an underused garage or vacant patch of grass that could accommodate an accessory dwelling unit. By adding one or two residents per lot, these units would, supporters say, exert zero aesthetic or traffic impacts on the city’s residential neighborhoods. Cuff noted that if 20 percent of the city’s 500,000 single-family lots included ADU’s, that alone would reach the mayor’s goal. As well, an embrace of alleyways could create brand new front doors. These design solutions need to be legal before they are implemented. With the mayor issuing such a bold plan—and directing all city departments to do their part to realize its goals—architects are hoping the city will update its regulations accordingly on issues such as setback requirements, parking regulations, height restrictions, floor-to-area ratios, and density in transit-oriented neighborhoods. “There’s definitely going to be a lot of collaboration required both between departments and between different facets of the city government,” said Ashley Atkinson, planning and housing specialist for Garcetti. 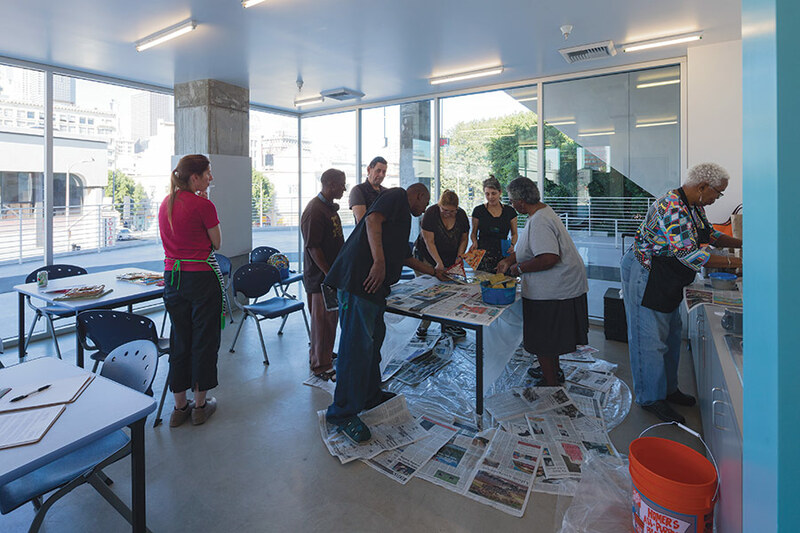 If the city succeeds in streamlining its administrative process and reconciling its planning and building codes, architects and developers may be significantly freer to go about their work. Will Wright, director of government and public affairs for AIA/LA, added that the city needs to provide for more by-right development and minimize the negotiation among developers, stakeholders, and city council members. The fenestration on Maltzan's building varies across the elevation, creating a sense of movement. As California’s tech industry continues to migrate south to Los Angeles, its epicenter has become Playa Vista, where Google, Facebook, YouTube, Yahoo, Konami, Belkin, and others have established offices in the past few years. 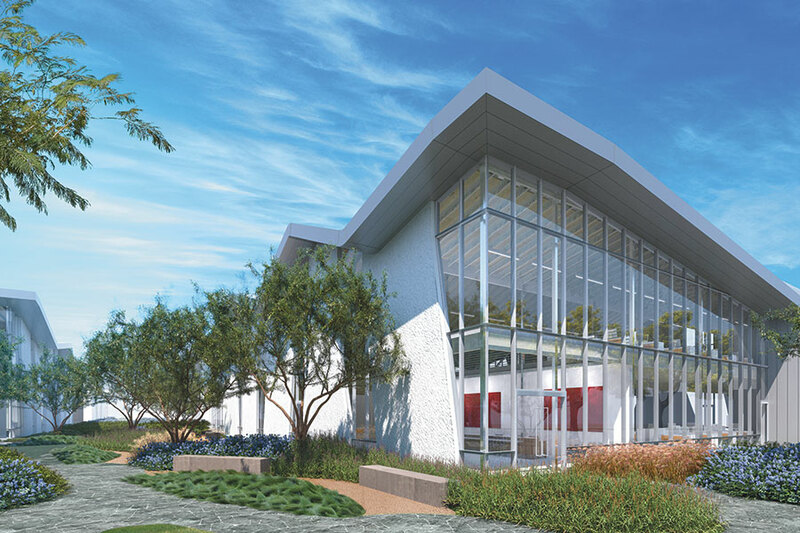 While the redevelopment of Howard Hughes’ historic Hercules Campus— overseen by Brenda Levin and filled in by several talented teams—is a model of adaptive reuse, much of the new architecture in this former marshland has been formulaic or worse. But two new creative office projects at the east end of Playa Vista, developed by Tishman Speyer and designed by Shimoda Design Group and Michael Maltzan Architecture, are taking Playa Vista—and perhaps Southern California tech architecture in general—to a new level. The two buildings designed by Maltzan sit adjacent to a park designed by the Office of James Burnett. Shimoda’s project, The Collective, includes five two-story buildings, connected by grass-lined walkways and divided into two parcels. Structures consist of pre-cast concrete and wood framing, and are clad with rolled metal paneling and glass curtain walls. Sarnafil-clad roofs angle quite sharply, continuing along what Joey Shimoda, the chief creative officer of his eponymous firm, calls “a rolling wave.” Tall floor heights range from 15 to 21 feet, while holes punched between levels and open floor plans make the interior seem even larger. 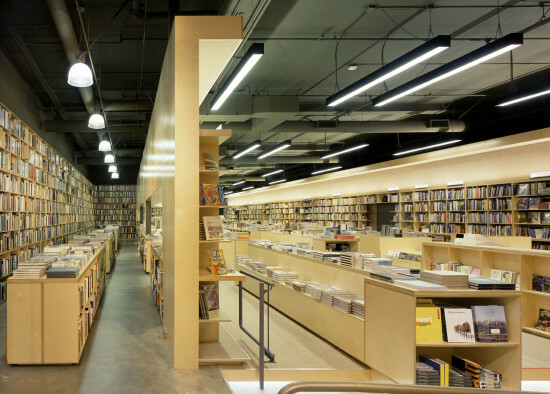 Rows of Solatube skylights keep the spaces from requiring much artificial light. Shimoda said his designs—which feature huge shard-like exposed concrete frames and shining strips of metal—were inspired by Hughes’ airplanes and hangars in both their immense scale and jutting shapes. Another inspiration, said Shimoda, was the movement of the nearby ocean, which pervades the area’s culture. “It was about trying to get a different point of view, a newer interpretation of interior space,” said Shimoda, gazing out one of the large windows over the Playa Vista development. “They don’t want it to feel corporate at all,” he said. This sense of raw, generous space has basically become the developer’s definition of the creative office. Brochures for the typology now tout light, volume, space, expression of architecture, and an outdoor-indoor connection. Much of it is designed to not only lure talent, but to also convince employees to interact more and work longer hours in an informal atmosphere. The Collective is scheduled to open in September, and Maltzan’s office building is expected to be finished by the end of 2016. Maltzan’s project, which consists of a large, raised boomerang-shaped building and a smaller stacked cube (adjacent to a park that Maltzan and the new project’s landscape designer, the Office of James Burnett, designed a few years ago) are also geared toward creative tenants in both tech and entertainment. But its office plans are more eclectic, including open plans, traditional plans, and hybrids of the two. Lifted on stilts and connected by bridges, the white brick boomerang building, which his firm has nicknamed the “wishbone,” wraps around its lot, weaving up and down along its length. In many ways it maintains the attributes of an old mill building, said Maltzan. Shimoda’s buildings are composed of pre-cast concrete wall sections and wood-framed roofs. “If you take the fundamental qualities of those spaces—big open floor plates, tall ceilings, real access to light and views—they are very useful in any kind of space where you have a culture of making things,” said Maltzan. In some places the building’s oversized windows will appear to overwhelm its opaque surfaces. The cube-shaped building, adjacent to Maltzan’s park, is designed to define space at the head of the recreational outlet, and to provide views of the landscape. The buildings’ stark differences will give potential tenants—both buildings are spec—the maximum variety of choices. And Burnett’s landscape for the new project will draw on some of the formal geometries of the park, bringing, for instance, sloped berms down to the parking lot, and connecting to the site’s open spaces. “Tishman Speyer has really made a commitment to a very high, ambitious level of architecture. 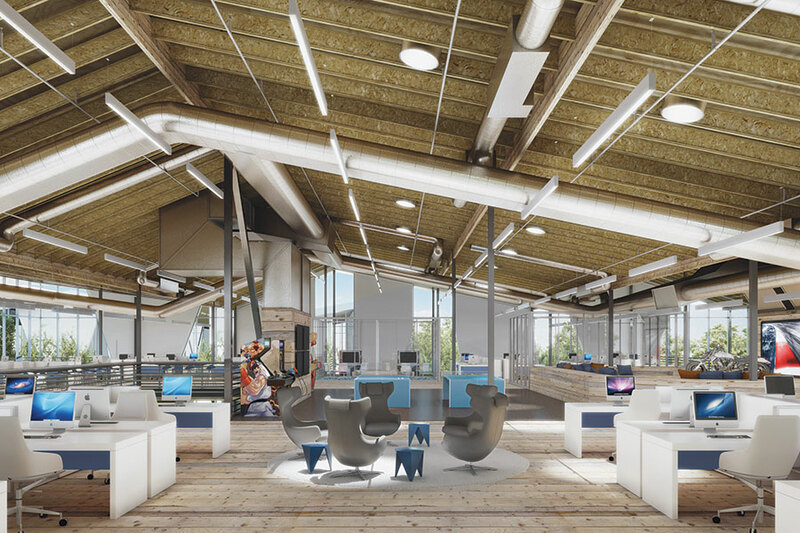 They’re very open to trying to make new forms for creative offices,” said Maltzan. About 10 years ago, the city of St. Petersburg, Florida started talking about tearing down one of its most well-known piece of architecture: a 1970s-era, inverted pyramid at the end of a city pier. The city would then replace that pier head with a more modern, but still architecturally significant, statement. So, a few years back, a design competition was launched, and it resulted in some of the most ambitious designs we’ve ever seen from a competition like this. The Bjarke Ingels Group (BIG) created a massive, spiraling loop, West 8 designed a sea urchin–shaped pavilion, and Michael Maltzan Architecture envisioned The Lens, a massive circuit of bridges and pathways that connect into an angled canopy—or lens—that faces back toward the city. Out of that short-list, Maltzan came out on top, but nothing ever materialized and the inverted pyramid is still standing. Long story short: voters overwhelmingly rejected the $50 million plan at the polls, a new mayor was elected, and then, this fall, a second, more public-facing, competition was launched. Now, eight designs from that competition have been unveiled. While the teams competing aren't as well-known as those in round one, their designs are no subtle gestures. Each team received a $30,000 stipend for its work, meaning the second competition has already racked up nearly a quarter million dollar bill. That's on top of the millions of dollars poured into the first competition that didn't really go anywhere. 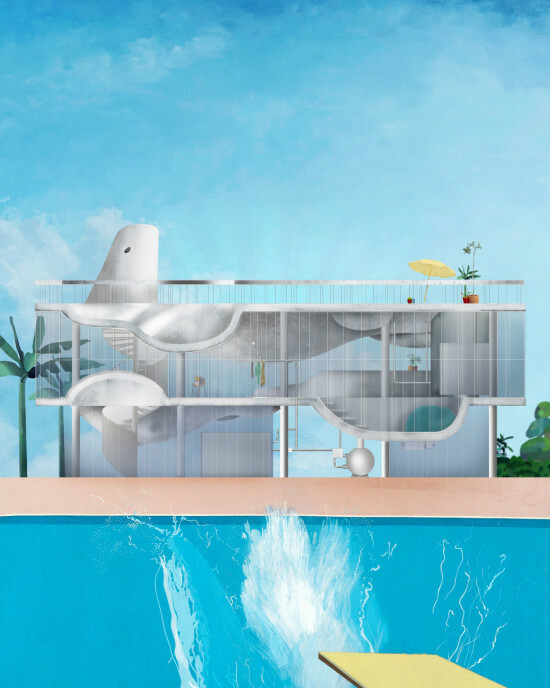 All of the new plans come with extraordinarily splashy renderings (literally, there are dolphins splashing around in one), and long, detailed plans. One proposal is even paired with a video set to Frank Sinatra’s "Somewhere Beyond The Sea." Following public input, the City Council will approve one of these plans next spring. A St. Petersburg official told AN that funding for the pier has already been allocated and would not have to go back before the voters. For this round, each team was asked to work within a construction budget of $33 million. And now onto the proposals for round two: Prospect Pier FR-EE with Civitas + Mesh From the architects: Prospect Pier celebrates our unique geography, culture and history as a subtropical, waterfront city. 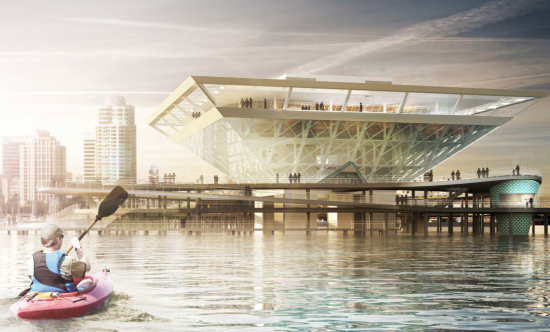 In a reinvented Pyramid that looks to the future, it builds upon the Pier’s assets – a strong form floating over the water. Our vision is a journey that begins downtown, passes through a vibrant park and becomes a magical stroll over water before ascending through active, public spaces culminating in breathtaking views of city, sea and sky, high over Tampa Bay. Destination St. Pete Pier St. Pete Design Group From the architects: The St. Pete Design Group's concept provides the perfect marriage of historic icon and modernized, functional pier; a pure, crystalline pyramid is surrounded by fun, contemporary elements and activities within multi-leveled layers of shade. Varied attractions that will keep residents and tourists coming back include a larger Spa Beach, multiple dining options, a children's zone and a spectacular waterfall. Come fish, play, relax and remember. Discover the New St. Pete Pier. The Pier Park Rogers Partners Architects+Urban Designers, ASD, Ken Smith From the architects: The ASD/Rogers Partners/KSLA design honors St. Petersburg Pier’s robust, eclectic history while transforming it into a 21st century public place. It is a hub for activity; not only at the pier head, but all along its length. Flexible programs engage tourists and community alike – from children to seniors, nature lovers to boaters, fishermen to fine diners. The Pier does not take you to a place – the Pier is the place. It is THE PIER PARK. 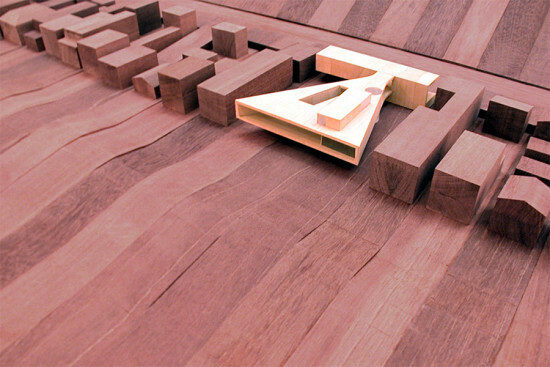 ALMA Alfonso Architects From the architects: The Soul of the City. Cultural Icon. Just as the Eiffel Tower image alone can conjure up an entire cultural experience by merely representing a fragment of the City, the Pier transmutations over the years have served as the symbol and spirit of the place that is St. Petersburg. Our project will recapture the past, embrace the present, and look to the future ALMA: The Soul of St. Petersburg. Blue Pier W Architecture and Landscape Architecture From the architects: The vision for the St. Petersburg Blue Pier lagoon park is a grand civic gesture bringing the pier, bay and natural landscape closer to the city. Blue Pier acts as a unifying element uniting the Bay with the City along a new axis of recreational and economic activity. Starting new allows us to set a new sequence of events in motion to make the pier even more successful and relevant for the coming century. rePier Ross Barney Architects From the architects: repier is a vision of St. Petersburg as a catalyst for more environmentally-friendly, physically-engaging, and socially exciting urban living. repier adds opportunities to engage with the water, creates marine habitat, provides places to snack and sit in the shade, and builds a social space that also generates electricity. repier projects progress and hope and provides St. Petersburg with a place that is useful and loved. The Crescent ahha! - New Quarter From the architects: The crescent as a metaphor for the growth of our community. A gathering place for the people of St Pete; a place for learning and play. A place that is self sustaining. How does one have a pier experience without actually being on a pier? Why not go out on a limb? Isn't that where the fruit is?" - Frank Scully Discover Bay Life VOA From the architects: “Discover Bay Life” respects the past and looks to the future by transforming the upland park and pier into a new destination for St. Petersburg. Just as life on the Bay continually transforms, so does life at “The Pier”. Three destinations - Bay Life Park, the Pier, and the Marine Discovery Center - become one unique destination for locals and visitors to discover and enjoy year around. 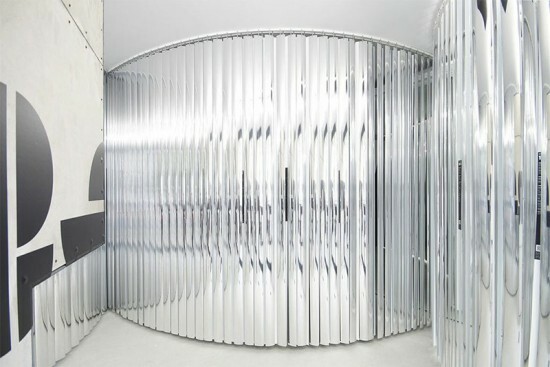 Michael Maltzan and Amy Murphy's layered, architectural installation design for Haunted Screens. Monsters, madmen, and magicians play starring roles in Haunted Screens: German Cinema in the 1920s, an exhibition that runs through April 26 at the Los Angeles County Museum of Art. It’s a worthy successor to LACMA’s many explorations of that fertile era of experimentation. German studios churned out plenty of fluffy entertainments for mass consumption, but they also produced (as Hollywood rarely did) works of art that made few concessions to popular taste. The production sketches, stills, and movie clips from 25 features included in this exhibition reveal the huge potential of film to probe human psychology and imagine worlds that never were. Architects will be drawn to the elaborate sets and city streets, and by the installation, which was designed by Michael Maltzan and Amy Murphy. The show has a strong emphasis throughout on architecture and urbanism. LACMA curator Britt Salvesen divided the 250 exhibits into four thematic sections and deftly wove them into a visual narrative, elucidated by succinct text panels. Within each section, one can review set and costume designs alongside production stills for a few features, and then step into a darkened space to watch excerpts of those films, back-projected onto suspended screens. Happily there was a rich trove to draw on, principally from the collection of the Cinémathèque Française in Paris. Hollywood studios squandered their treasures, treating talent as hired hands, and junking their archives. Most of their publicity stills were portraits of popular stars; at UFA, the leading German studio, up to 800 photos documented every aspect of a major production. Lotte Eisner and other dedicated archivists rescued prints and drawings that survived wartime devastation and carried them off to the Cinémathèque. In doing so, they preserved a legacy of art and history. Jagged surfaces convey an air of dark uncertainty. Like the painters and sculptors whom the Nazis would soon condemn as decadent, filmmakers—including Fritz Lang, F.W. Murnau, Georg Pabst, and Robert Wiene—mirrored the turmoil and creativity of the Weimar Republic. The distorted houses, oppressive city streets, and sinister laboratories they constructed on stages and back lots mirrored a society struggling to break free of the past, even as its economy and government foundered. Whereas the best German architecture of the 1920s—from the Weissenhofsiedlung to luxury villas and workers’ housing estates—is cool and rational, filmmakers exposed the contradictions of the times and the dark underside of material progress. Their subjects ranged from grinding poverty in the slums to the polarization of wealth, futuristic fantasies and folklore, surveillance and the threat of new technologies. The demons that haunt these films would soon achieve power: critic Siegfried Kracauer entitled his history of film, From Caligari to Hitler. To articulate this multi-layered story and heighten its impact, Maltzan and Murphy have constructed a trio of wave-like forms to enclose projection screens, which are set at angles to each other, so one can watch one or several clips simultaneously. 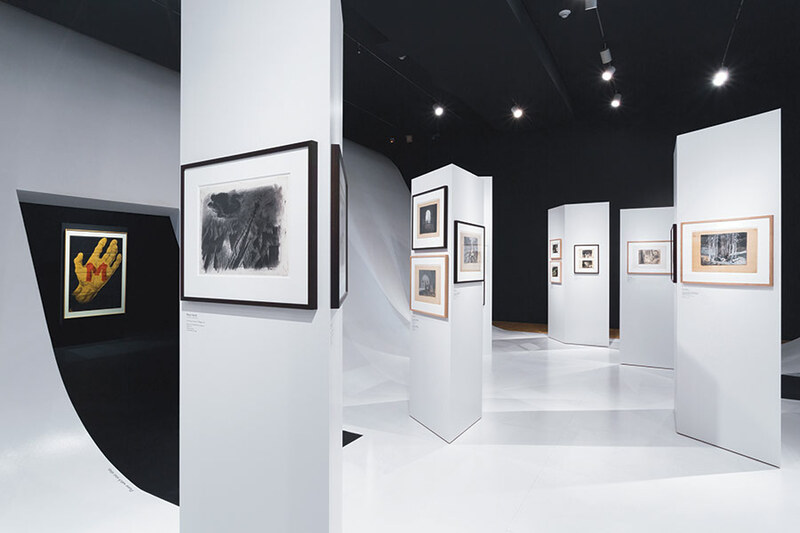 In the troughs between, small drawings and production stills are displayed on the canted surfaces, shard-like columns, and a jagged, open-ended frame. Posters occupy the side walls of the gallery, and sound cones descend from the ceiling. The installation is easy to navigate, but it subtly conveys an air of menace, mystery, and insecurity. 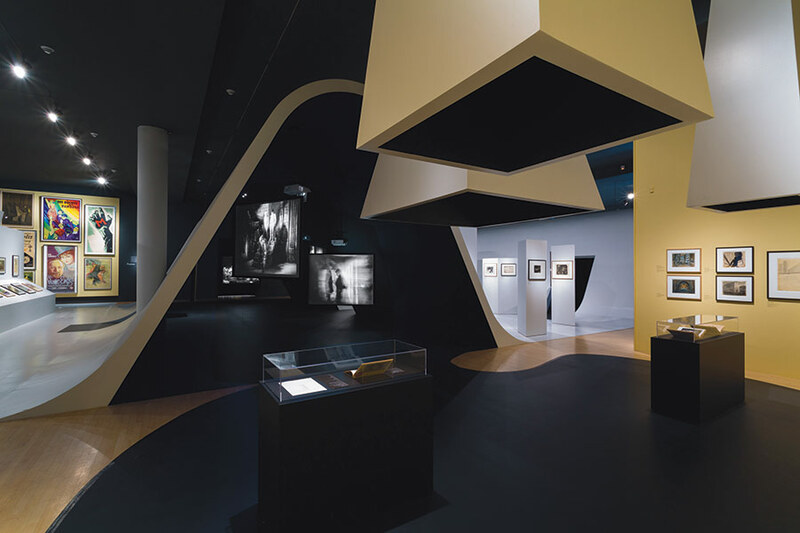 Within a confined gallery, one can examine the exhibits, absorb the febrile atmosphere of Weimar, and surrender to the timeless magic of the movies. LACMA is an appropriate host. 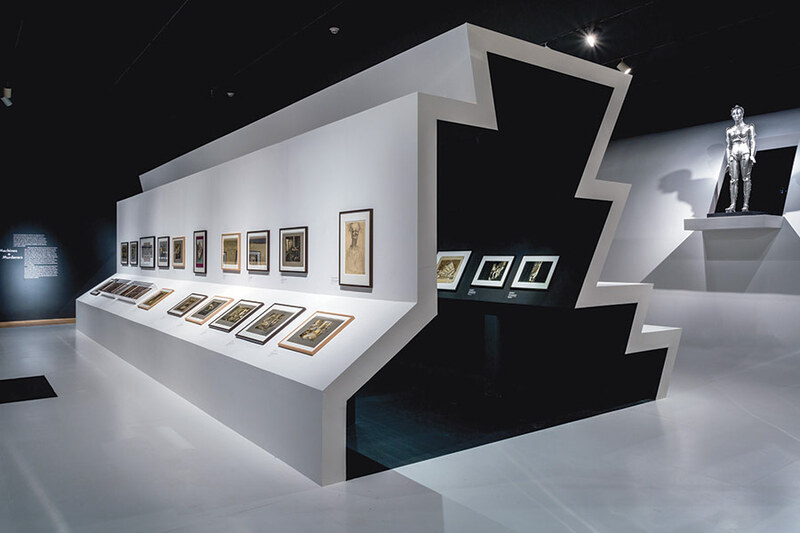 It frequently presents selections from its fine collection of German Expressionist art, and commissions leading architects (including Frank Gehry, Morphosis, and Frederick Fisher) to install exhibitions. And it is located in the city that lured the finest talents of Germany in the years between the two world wars. Writers, directors, producers, actors, and—most successfully—cinematographers and composers migrated to Hollywood, initially for the money, and later as refugees. They brought a new sophistication to an escapist industry, and they helped establish the genre of film noir. For a decade, LA became Weimar on the Pacific, and there’s a faint echo of that era in the more interesting independent movies of recent years. Haunted Screens takes us back to the source.